Hilarious, deserves the grief.... There's a guy on Ebay been asking £10K for a Casio CZ1 synth just cos. it's been touched my Vince Clark, this is a £300 synth at best. I find it funny every day to see it still there. Nutters. Would the adams family be a good deal without VAT? How can you be charging VAT on a twenty year old game? by turning over more than £85K a year worth of eligible sales? I don't know why they wouldn't use the VAT Margin Scheme for high value second hand items like this. My TAF will be available soon. Just need to sort a couple of niggles, or new buyer can sort them for a discounted price. Bid Live on Lot 76 in the Antiques & Interiors Auction from Mander Auctioneers. Star Wars LE on Ebay. Looks stunning. 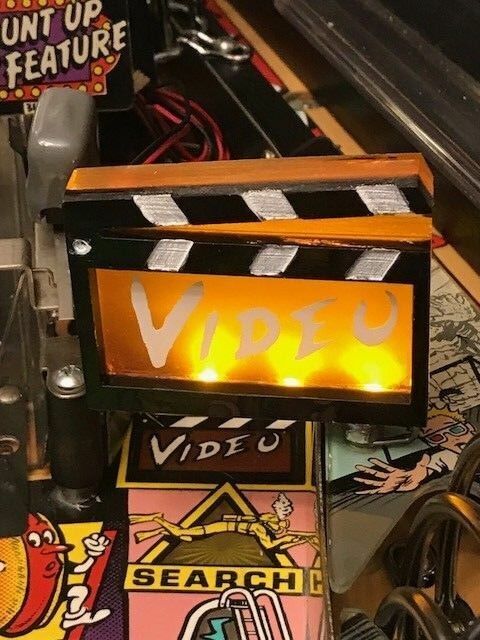 Find many great new & used options and get the best deals for STERN 2017 STAR WARS LIMITED EDITION ARCADE PINBALL MACHINE HUO MODS MODS MODS at the best online prices at eBay! Free shipping for many products! The Star Wars is at Tobin’s house. He is a top man, I’ve brought a few machines from him. @stumblor I very nearly shared that same picture of the guy who touched up that playfield but I didn't want to be too mean, plus it's a far better job that what I could have done. That's why my Stargate bugs the hell out of me, the flipper area is trashed and I'm too scared to try and repaint it ? Played that the other day , it’s insane it has like all new clips and sounds from the movie custom call outs and mad stuff going on .. there is like a pc inside it that controls the side blades ..... a pretty unbelievable modded machine kinda taking modding to another level . few hundred quid more and get the Iron Maiden LE he has, a million times better game than Star Wars. so at worst you would be paying VAT on the difference the product was bought in for vs sold for and at the reduce rate, as I recall 16%? I want this! Just got to find some £££! Shame the guy who did the mods on that Star Wars use STAPLES FOR POWER WIRES!!!! it would take more than a few fancy lights to make me want to pay that for a Star Wars. Its utter pants. The bozo that does the call outs sounds like he should be working in Woking train station announcing the trains more than doing Star Wars! Biggest disappointment ever! Yeah I initially wish I had done that because of all the mech issues, but now I've got them dialled in and after playing the Pro at Chief and in Stockholm I'm glad I held on to the LE. The way the ramp works for modes and mummy is so much better IMO. Just had a quick look at the bay for fun. Can't believe that the taf , Tom and tz are all advertised over 6k. I know they won't sell for that but still. Just had a quick look at the bay for fun. Can't believe that the taf, Tom and tz are all advertised over 6k. I know they won't sell for that but still. And a CFTBL . Not much info. Clap Sticks is custom designed toCreature From The Black Lagoon. Because our mods are handcrafted, lighted and colored, there may be a very slight variation from mod to mod. Every mod is quality hand crafted, therefore there may be very slight variations. Hi Regretfully for sale is my getaway pinball maschine in good worrking order. Well sought after machine. Comes with original manual spare bulbs and rubbers. Collect from castlepoint area. flash gordon vintage pinball machine | Video Games & Consoles, Coin-Operated Gaming, Pinball Machines | eBay! Small world - I went and replaced a drop target or something on this machine about 7 or 8 years ago I think. She didn't want to sell at the time , turning down my offer of a few hundred quid for it .... all yours now for 2500 ?